The initial global grant (2003-2005) was given to the Vitra Design Museum in Weil am Rhein, Germany and focused on the study of the material qualities and life expectancy of design objects made of plastic. 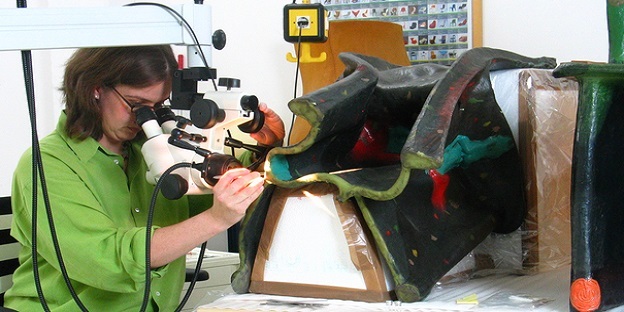 The extensive use of various types of plastic by artists and designers in the 20th century has thrown up many conservation problems in museums and private collections. For this reason AXA ART and the Vitra Design Museum initiated a joint project to learn how to conserve plastic items. The Plastic Art project focused on the study of four objects, including the Panton Chair, Gaetano Pesce’s Il Piede (1969) and his Pratt Chair. Findings are documented in the publication, Plastic Art - A Precarious Success Story. As a result, we now know that objects made of plastics degrade more rapidly than those of traditional materials, that multiple plastics used together can degrade at different rates, and that some degrading plastics release chemicals that can damage other items close by. Another outcome of the project was the formation of a set of basic rules to mitigate damage to plastic art from sunlight and other external sources. Owners of plastic artefacts are now advised to protect them from exposure to direct sunlight and store them in open conditions in well-ventilated rooms at a constant temperature. They should be regularly checked for signs of degradation and handled carefully as over time they can become fragile and brittle.